Do I need even need a criminal speeding attorney? How many points can go on my license before it is suspended? When you receive a traffic ticket, a common question people ask is how many points you can accumulate before your license is suspended. Arizona operates on an accumulation scale, meaning that adding points to your license can trigger penalties (some other states operate by subtracting points). At 7 points or below, there are no penalties assessed by the motor vehicle department. They will not automatically suspend your license or require you to take traffic survival school. Any points are still reported on your motor vehicle record and can be viewed by your insurance company or employer, however, so it is best to keep your record as clean as possible. If a person accumulates anywhere between 8 and 12 points within 12 months, that person is required to take Traffic Survival School (TSS). However, if a person has already attended traffic survival school (TSS) within the last 24 months, then that person is not eligible to take it again. If this is the case, that person’s license will automatically be suspended for 3 months. If a person accumulates anywhere between 13 and 17 points within 12 months, there will not be an option to attend Traffic Survival School and that person’s license will automatically be suspended for 3 months. If a person accumulates anywhere between 18 and 23 points within 12 months, there will not be an option to attend Traffic Survival School and that person’s license will automatically be suspended for 6 months. If a person accumulates 24 points or more within the past 36 months, that person’s license will be automatically suspended for 1 year. There will be no option to attend Traffic Survival School. It is important that the accumulate of points under this category lasts for 36 months, and not just one year like the other provisions. You calculate the total number of points on your record by starting with the date of the violation and not the date of the conviction. The points accumulate from the date of the violation to the present time. To add your points, start with today’s date and look back at all the violations that you have been convicted on where the date of the violation occurred within the past year. This is your total number of points. Keep in mind, there is a 12 month calculation for most levels in the chart, except when there is an accumulation over 24 points. How many points will I get for this offense? Other violations, such as commercial overweight violations or failure to stop at point of entry do not have points. All photo radar or photo enforcement violations have points in Arizona pursuant to the scale above. How can I tell how many points I have on my license? If you have an Arizona driver’s license, it is easy to obtain a copy of your motor vehicle record. Follow the steps below to obtain a copy of your record. Motor vehicle records can be a bit tricky to review. After obtaining your report, you can can send it to our team using the form on this page and we will be happy to provide you with a brief analysis. 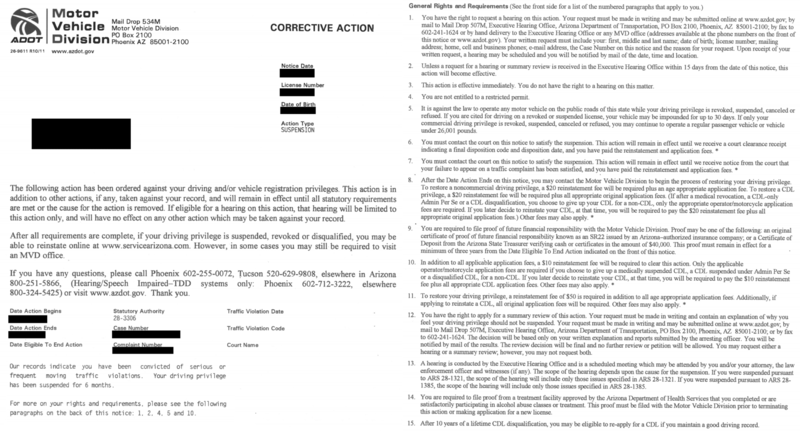 Step 1: Visit www.servicearizona.com and click the link to obtain a copy of your motor vehicle record. Step 2: Next, select the option to choose your 39-month, uncertified motor vehicle record. Step 3: Fill out all of your information. You will need your name, driver’s license number, last four digits of your social security numbers, and a debit or credit card to pay a $3 fee. Note: the MVD will charge you the $3 fee whether they are able to find your record or not – be sure your information is entered accurately! Step 4: Save / print or download a copy of your motor vehicle record. Step 5: Send it to our team along with your current question, citation, or message and we will be happy to review it for you! You may use the form and upload dialog box at the top of this page to send your information. What happens if I get too many points on my license? This document describes the nature of the “Corrective Action” and the reason for the penalty that is imposed. On the back of the document or on the second page, the form will list the specific rights and requirements that are available to the driver. Based upon the violation, our office may be able to request a hearing to determine whether or not anything can be done regarding the suspension. Often times, dates or other important information is not properly transferred from the Court to the MVD and it may be possible to reduce a suspension, waive points, or obtain a restricted permit. I have more questions, can you help me with my license? Of course! Call our office or submit your question and case information using the form on this page. Our team offers free, no obligation case evaluations and we hope to answer your questions soon. Contact our team today! 480-500-8762 Free Case Evaluation! Call Today! Are you worried about a license suspension or accumulating too many points? Call our office today for a free case evaluation. In many situations, we can offer affordable rates for representation to help keep you on the road. We offer free case evaluations and affordable payment plans. Call us today to speak with an attorney immediately! What Happens When an Arizona Driver Gets a Traffic Ticket in New York? Friday October 27th: Have fun out there. Be safe. If you need us, we’re here. Friday October 20th: Have fun out there. Be safe. If you need us, we’re here. What Should You Look for in a Criminal Defense Law Firm?